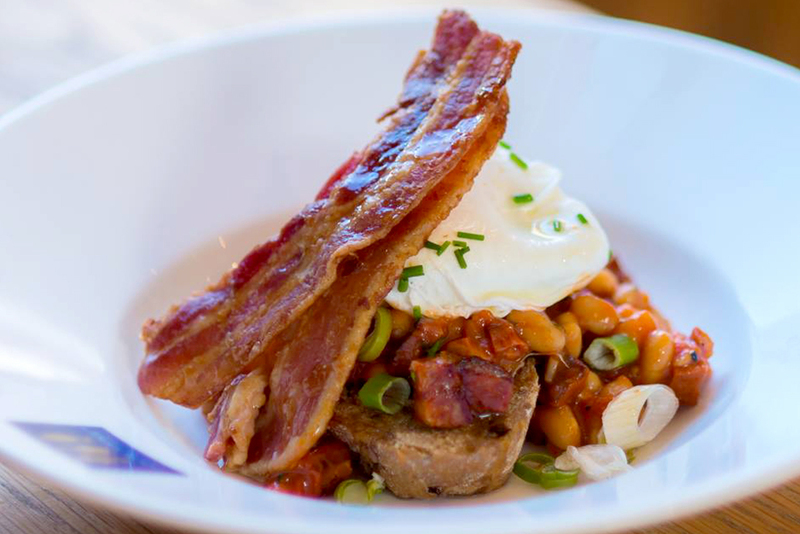 Start your week off with a Loch Fyne Breakfast, every day between 9am and 1pm! Fancy Eggs Benedict or a Full English, you can even personalise your own breakfast. Prices vary depending on what you choose but are very reasonable, take a look at the menu and book! Book online for free text confirmation or call 0115 754 6840. Bring the little ones, 2 courses for just £7 or 3 courses for only £9! Book online for free text confirmation or call 0115 754 6840. Great meal , for our Anniversary. Nothing too much trouble for the staff. Will return soon. I dine here with friends on a regular basis. Always very happy with the food and service. Staff member serving us was very attentive and helpful. Service was not particularly slow but staff member advised a bit slower than they like, so was compensated with a bread basket (without asking). Great meal, food and service. Very good in every way . Good meal & excellent service from a lovely waitress called Sava. Was beautiful from start to finish. Oysters were amazing and the service was fantastic had a really lovely time. We both had a lovely time, but the tables are very close to each other, not a lot of room with people brushing past you, and the Ambience of the building is not warming more like a canteen in a large factory. On the plus side the food was fabulous and the services very good and friendly. The meal was amazing and so was the service, we will be returning. Although the time waiting to be served was swift, the severe lack of general warmth from the staff in the restaurant left us feeling that we would never want to return. Such a shame when the food was so pleasant. Excellent food, slightly small portion sizes on the mains. Staff were really friendly and helpful. The meal was delicious and the staff very friendly. Very good service would definitely recommend. Loch Fyne oysters and champagne: chargrilled tuna steak all beautifully prepared. Helpful attentive service. Enjoyable experience. A really good end to an evening at the Panto. The service was impeccable and the quality of the food was special. Would highly recommend. Friendly greeting, given choice of tables to sit at. Good selection of drinks, drinks came quickly after ordering, food was well presented and came at good intervals between finishing courses. Steak cooked exactly to how I asked for. A great place to eat for couples, small or large groups. Would definitely go back. Our food was delicious, although I couldn’t appreciate the full flavour of my oysters. They were just TOO cold; perhaps because the restaurant was on the cool side. My daughter and I had to replace our coats! Our waitress was very good indeed. The man on duty could have been better; no personality or customer relationship. Communication skills are poor. We’ll book again soon. Fabulous attentive staff, lovely food. If you love fish it’s well worth a visit. Liked the foods a lot. Always love this restaurant, great staff, delicious food and relaxing atmosphere. Great meal - well worth the visit. As usual brilliant food. Love it. 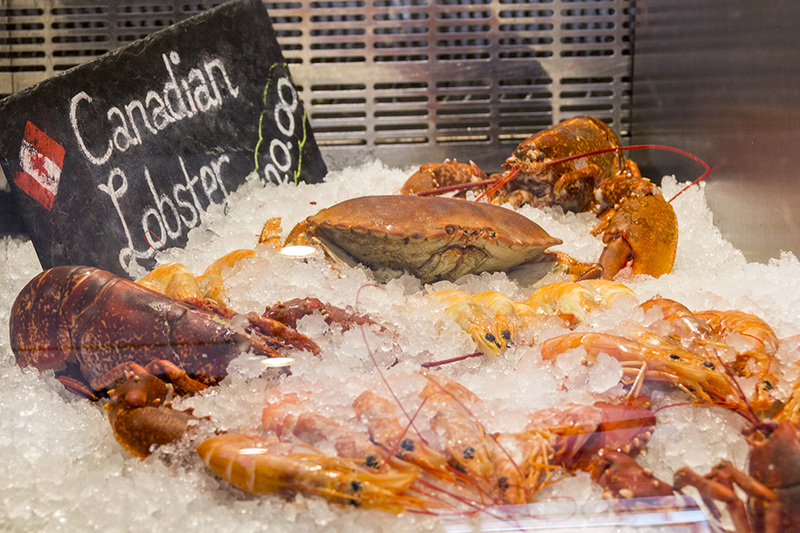 Loch Fyne has very good, fresh seafood. Oysters excellent. My brown crab was probably the biggest I have ever eaten and also excellent. My guest had pan-fried fish which was slightly overcooked. Fish restaurant should know that fish should always be slightly undercooked, rather than overcooked. Excellent food and service. Very welcoming. Restaurant good position for theatre, good choice on menus and the staff are welcoming. Always worth a visit but still a chilly place when the wind whistles through the door! Super welcome and excellent service throughout the meal. Food was very much to our taste and reasonably priced. The quality was better than several London restaurants offering similar fare. The lost star for Ambiance wasn't the restaurant's fault, it was down to a very loud opera buff telling everyone how clever he was. We are going to book again before Christmas. Online, booking was very easy. Lovely meal of high quality. I had tuna steak, slightly overcooked for my liking but still very good. My friend had the Hake and enjoyed it. Service was friendly & efficient. Will definitely return the next time I visit Nottingham. Lunch menu is great when meeting friends in town, service was very good, but we were the only ones in, so I should want it to be, being quiet meant there was little atmosphere, although we were busy catching up with the gossip so didn't worry too much. Food is good value, drinks perhaps a touch expensive, but it is city centre! Hugely enjoyable first visit to Loch Fyne. The serving staff were welcoming, attentive and friendly and the food - we both had fish dishes - was delicious and plentiful. Our only complaint is that there isn't a Loch Fyne in Leicester - where we live. I hope there is a chance of that happening. The service was excellent, and the food freshly cooked and delicious. The food was excellent. Beautiful fresh fish. Service was great. Not overly priced either. There was a large table of diners of all ages, that weren’t that quiet. Apart from that 10/10. Obviously not the restaurants fault. Fantastic meal. The whole John Dory was excellent! Not good when we arrived as they had no knowledge of the booking. Once found a table it was great. Simply good fresh fish and veg cooked to perfection. Food great. As expected. Waiter run off his feet. Did his best but we had a long wait for good. A few items let this place down. Firstly our table was so tight in a corner near the window that one person at our table couldn’t even pull there chair out. It’s took along time to get served and when we did the whole table couldn’t hear what she was saying due to it being very noisy. Once our drinks order was taken it was a very long time to get our drink. The meal was amazing but I don’t think anyone on our table would like to return. The meal and service were excellent. We started with salt and pepper squid which was delicious! Unfortnatley the restuarant was not expecting us!!! Lucky they were able accomadate us. Especially as it was a special lunch for my sons graduation. The meal was lovely. The website said there was an offer on until 18:00 but when we got there we were told by the waiter that he had to put our order through before 17:30. So we were quite rushed but the choices weren't many so we were able to do it. Excellent food and service. Staff were very friendly and discreetly attentive (not asking questions all the time). Central locations meant it was easy to get to. The seafood was extremely fresh and the waiters were around the moment you needed them. A very enjoyable meal the sea bass was cooked to perfection. Food excellent with plenty of choice. Waiter was attentive and knowledgeable. An enjoyable early evening dinner with good options on the fish mains. Lovely food, with great service. Normal very good service during a very busy evening. Excellent food. Everything was lovely, I mentioned it was my birthday in passing and got special treatment. Jane is lovely. Only 4 stars for ambience as we were the only people in there for Sunday breakfast and I think the ambience is better when there are other people around. But had a lovely time. Superb food and excellent service - will definitely be returning! Loch Fyne is the best fish restaurant in the City. I am never disappointed with the quality of the food which always tastes amazing. The staff are also extremely customer friendly and cannot do enough for you. I can’t wait for my next visit. Fabulous meal again, cooked well and full of flavours. The welcome and service was very attentive without feeling intrusive. I had fish soup to start, followed by smoked haddock and mash. Partner had smoked salmon three ways to start followed by grilled sea bass. All exceptional and good value no room for a desert. Excellent. Couldn't fault it this time. Pre theatre set menu was not available but had the a la carte and a bottle of wine. which was great. They gave us 20% off. A really lovely meal which could not be improved on. Only criticism was perhaps have done with another scallop on the starter. It took half an hour to get a drink! Our waiter went out for a ‘break’ while we were still waiting for our starters. The food was pleasant enough but not outstanding. First time there and excellent definitely will be going back. Best fish restaurant in Nottingham. Oven problem so restricted menu choice. Food was good but, in my opinion, a little on the expensive side. Waitress was great. Ambience was only classed as 3 because there were only a handful of customers - Wednesday evening, though. We had a party of 7, and 3 of which were running late. The staff were very accommodating given that it was Mothers Day and very busy. In the end the meal was served with everyone at the table and at the same time - thanks. We have been a number of times before and are familiar with the standard of food - hence we keep going back. The staff are always friendly. Very good food (as always). Exceptional friendly and efficient service (as usual). Excellent food, sea bass was cooked perfect.. The staff was very frendly and it was very busy that day. The squid starter was nothing special. I ordered the seafood pasta which had no sauce (white wine and cream). My wife's fish and chips were good but mushy peas disappointing. Not impressed by the view of the open disabled toilet which a member of staff left open. A busy but welcoming atmosphere with good food and friendly service. Absolutely lovely trip. I went for some good mussels and that's what I got, Tuesdays mussel madness is one of the best all you can eats I've been to. A nice range of sauces without a long wait time. With all of this for £15 base price for food and a drink there's nothing to argue with. Excellent meal as always I use these restaurants alot. Also offers are available if you eat early which is useful if going to the theatre. Excellent food from their £10.95 2-course lunch. Good attention to details and flavours. Service at just the right pace. We enjoyed the food very much. However, we did have to wait for the sweet. To which they apologised. We would go again. Liked it a lot! The waiter was very helpful, pointing out the disabled toilet. He was very attentive waiting on table. We had the 2 course set menu for £10.95 including a glass of wine which was excellent value. Our table was next to the entrance door and when opened we got a cold draught. The service was very slow and inefficient we had to ask several times to different waiters for our dessert. Eventually came after about 30 mins. We complained and didn't have to pay for dessert. Loch Fyne Nottingham you need to up your game with service we have been many times over the 2 to 3 years but noticed over the last 3 visits a decline in customer service especially compared to other locations such as Bath where service is always excellent. Really enjoyed my visit and the food and service was very good. Second visit to lock fyne & it was as good as the first. Great meal deals! We had an early dinner menu for £12.95 for 3 dishes, which was excellent. Service was friendly and mostly efficient. Food was very tasty, but would say slightly on the smaller portion side. Highly recommend the king prawn spaghetti! Good food, quite good value, a little cramped for space, service good. Excellent choice of food, brilliant service. The food was amazing. I had a t bone best I’ve ever tasted! Lovely evening with wonderful service. Our waitress could not have been more attentive and helpful. Will be returning. Best fish pie ever and great crème brûlée. Service friendly and attentive initially, though felt we were neglected a bit in the middle. Good atmosphere and lunch set menu excellent value. Lovely meal and took friends for the first time they really enjoyed it too! Good fish and. Chips. Next time will try smoked haddock. Looked good. Our waiter ash was very good. Our first breakfast and for some of our party first visit to Loch Fyne all agreed is was a great way to start the Christmas party Oysters and tequila shots all round.......well done Loch Fyne. Food, as usual was good but not first class. We booked a pre-concert early meal. Restaurant was not too busy when we arrived. As it is getting close to Christmas we realise that parties are being booked but the staff seemed to be constantly moving tables to accommodate them, even lifting them over our heads, which rather alarmed our 89 year old mother. Staff were friendly and very helpful. Very cold and freezing whenever the front door was opened. Excellent meal, couldn’t fault the venue or staff! Overall meal experience good, starters arrived in good time, main courses were very good, had to ask for salt and cutlery though. Had a bottle of Pinot Grigio which went down well. It was very quiet when we arrived, the waiters were standing about chatting and it looked like there was nobody actually in charge. We waited 45 mins for the starter, I had mussels which were ok but not that warm. 1 hour later we had our main course which was very average. Overall the meal was not too bad but the service was very slow and there were only two tables occupied! Our first time here. First class meal, top class service. We will be coming back for more. The food, the service, everything was excellent. Simply wonderful food. Both simple and wonderful. Unfussy, well cooked, well presented, unpretentious sea food. Better value as a result of a 2 for 1 mains offer. Otherwise I would have felt slightly indignant at the price.... But overall very good indeed. Everything was great, food is gorgeous at Loch Fyne, spoilt for choice for food. Attentive staff lovely meal, maybe just a little expensive. Fantastic meal great service from the newly appointed manager. Staff attentive and prompt. Too many tables in a small space made it difficult to navigate due to me using a walking aid. First time at this restaurant. Excellent meal. Will be returning. Great food and good service, few things came a bit late so some room for improvement but would definitely go again! I really enjoyed the meal. The Dover sole was lovely. The only problem was the noisy man on the next table who drowned out anything that we were saying but that was not the fault of the restaurant who provided their usual excellent food. I shall return soon. Great service, the waiter recommended lovely food. Deffo go back. A fantastic meal in a fantastic restaurant! thoroughly enjoyed the meal and will definitely be going there again! Service was exceptional and so was the food! Thanks for making it a great experience. Lovely meal would recommend highly! Will definitely go again. Good food. A combination of traditional with a twist of international. Good friendly and efficient service. Welcoming friendly service at Loch Fyne even though the restaurant was very busy. The food and wine were just what we wanted for a pre theatre meal. First visit to this branch and loved it. Very warm welcome and great service throughout. Both our main courses were superb as were the bread and olives to start and sweets. Great evening and very good value. We had a fabulous dinner at Loch Fyne. Hadn't been for a long while and it didn't disappoint. The chilli & garlic prawns and the scallop starters were delicious. Our fish main courses were fresh and my lemon sole was pan-fried, very tasty and succulent. Great advice from the waitress on sides abs sauces. The celebratory bottle of Prosecco went down a treat. Friendly and efficient service - good value for money. Can't wait to return! Very good value and excellent quality. Service was delightful and I would well recommend loch fyne to any shellfish lover! The food was very good as always at Loch Fyne, the wine was nice but quite expensive and the one server was run off their feet and left just before dessert leaving us waiting for a very long time to give our order to their stand-in, this also impacted on the wait for the bill. Nice place. We had been let down at a different restaurant.. Loch Fyne were more than happy to accommodate us although it was already busy. We had a lovely meal and vowed we would go back. We have since been back and the service and food were just as good as the first time. Thank you. Excellent food and very good service. Excellent and tasty dishes! Service excellent as always. Excellent meal at Loch Fyne served by a very friendly guy! Probably the best meal we've had at Loch Fyne. The menu sounded great and felt a wider choice. Every part of the meal was lovely and Hannah the waitress was excellent. Good food and delicious dessert at Loch Fyne. The wine we ordered was out of stock and the same grape wine that was available was much more expensive. Overall this place is top class, there was the warmest of welcomes waiting for us. Ambiance was perfect and the service was spot on. We had the two tier sea food platter,witch is basically ever shell fish you could wish for (Top tier is hot and the bottom tier is ice cold) Go here and try it for yourselves, you will not be disappointed. It is a bit expensive but you get what you pay for. Beautiful, beautiful food at Loch Fyne. First time dining at Loch Fyne. We would highly recommend a meal there! Excellent service from all involved and great value for the Mussel Madness on a Tuesday, although we couldn't manage more than two bowls! Booked for a pre-theatre meal which was excellent & value unbelievable. Unfortunately eating so early it was quiet & thus no atmosphere - still can't have everything! Loch Fyne is one of our favourite places to eat, the food is amazing. We've always had good service there to although I was disappointed in Saturday evening to hear 1 off the waiters/ managers moaning that they only received a small tip from a party of 6. In my opinion it doesn't matter how big/small the tip is or whether a tip is given or not. But I don't wish to here staff moaning about it on the restaurant floor while waiting for my food. Crowded but staff were great. Meal was excellent but a bit overpriced for a pre-theatre meal. We were a little disappointed to learn via making our booking that the pre theatre had moved from upto 7pm to 5.45 so we had to dine a la carte. The food however was exceptional. My partner had the squid which was light, flavoursome and came with a smoky dip. I had the soft shell crab pakora which was nice (secretly wished I'd had the squid). Mains were Thai moules and fish n chips. The only niggle is the kitchen sent out the fish without peas. An apology as made and they arrived later. Good food and a nice evening. I had a really nice meal although one person didn't enjoy her fish ( but she may have been a little fussy). Service was very friendly and good - the only slight criticism was the main course took a little longer to arrive than we would have liked. Otherwise an enjoyable experience. Mid week meal at Loch Fyne, glad we booked it was very busy. Service a little slow but the food was worth waiting for. Didn't expect too much before hand but was pleasantly surprised. Give it a go! On arrival,the atmosphere was very pleasant,comfortable, relaxed and civilized. Service was prompt, pleasant,polite, professional and well timed throughout. Food was excellent and furthermore gave us a feeling of being in the western isles of Scotland which is for my wife and I, the main reason of dining in a Loch Fyne restaurant. We will definitely recommend to others and dine here again. Food as ever was lovely. Even though it was very busy and all tables full the service was excellent. No long wait for food. Attentive but not intrusive waiter.. went at 5pm pre theatre with family. Will definitely go again! As ever our visit to Loch fyne was very enjoyable with very good service and lovely food. The only thing that can be improved is perhaps an inner door if you are in the wrong seat it can be cold and disturb your meal with customers coming in and out. Always have a lovely meal here. Staff, as always, were polite and attentive and dealt with us without any delays. The manageress was particularly attentive. She served us our meal and, having put my husband's meal down, she commented that she thought the piece of fish he had been served was really quite small so offered him a complimentary dessert - now that's what I call proactive service! Nothing was too much trouble. We will always keep coming back whilst the food and service are this good! These days, I very rarely get to try a food that I have not tried before (its to do with being old, well traveled and adventurous). Loch Fyne provided such an opportunity with their soft-shelled crab pakora. They were superb! Thank you Loch Fyne! It was a real treat to enjoy breakfast with a glass of chilled champagne...lovely! Loch Fyne one of my favorite restaurants. Although a small restaurant I feel this helps the friendly atmosphere of the place. The food is always well presented and freshly produced. Service is not intrusive but attentive. All together an excellent experience. Well done guys! Very good value set menu. Well cooked and presented. Good service and value for money. Thoroughly enjoyed a 3 course pre-theatre meal at Loch Fyne. The food, service and ambiance were all perfect absolutely recommend eating here and will definitely be back! Good service, mussels not the best I've had but the seafood grill made up for it. My husband had the soft shell crab which was delicious. Nice dining area but the toilets are pretty grim, a good clean up needed below stairs! Lovely place, the food amazing! Excellent quality seafood. Lunch/pre-theatre set meal at 12.95 for three courses incredible value. Service friendly. Room echoes a bit so quite noisy with conversations, but certainly has a buzz about it. The meals were all very good and enjoyed by both of us. The service was very good and the courses came in a timely manner. My wife and I thought there could be more attention and care of the toilets. Amazing meal, the haddock and scotch egg were absolutely delicious, perfect service, lovely people, had a great time there! Good food and helpful staff at Loch Fyne. No pressure to eat up and move. The lobster menu was not available in spite of being advertised. When I mentioned it, the waiter was apologetic and say the website was not up to date, nor was the black board behind him advertising Christmas parties. The food was OK, the mussels mariniere could have benefitted from a little more white wine and garlic and less cream. The service was a little slow but it was relatively busy. I think overall 3 out of 5 is a fair rating. Mussel Madness is amazing value and delicous! Boxing Day wouldn't be the same without our visit to Loch Fyne. No turkey, just fantastic food - yet again. We both had something different/new and were both very happy with our choices. Excellent food and service at Loch Fyne. Good choice of food well cooked and presented! Good food at Loch Fyne, extremely well priced with good service! Very pleased, will visit again! Wanted to visit Loch Fyne Nottingham for ages but never got around to it. We weren't disappointed, beautiful fresh fish, beautifully cooked & presented. Our first trip to Loch Fyne, despite many years of eating out at all levels. We were really impressed. I had 2 courses off the Table d'Hote menu and my husband ate from the main menu. Our starters were yummy - I had the smoked chicken terrine, and my husband had haggis and cheddar spring rolls (I sneaked one of them, and it was gorgeous). So often when eating out, I find I'm impressed with starters and then disappointed with mains, but not on this occasion. I had the confit duck leg and hubby had a dish that should have been smoked haddock, but he asked if he could have it with a pan fried salmon fillet instead, and they were happy to oblige. Both mains were lovely, very tasty and cooked beautifully, in fact it was the most tender duck I've ever had. We will definitely be going back. A tad disappointed. Been to Loch Fyne before but found the staff looked grey and it was seemed dirty going down the stairs and to the toilet area. It was busy so atmospheric. Starters, my good friend had oysters that she said were fab main we had a seafood platter £24 each. Whilst the salmon was good the mussels were overcooked and the rest was poor especially for the price. Staff were friendly but looked unhappy. Don't think I will go back. Fantastic meal and service excellent as always. We take our disabled mother as she loves the oysters there and parking right outside the doors is a bonus. Slow to serve ordered bottle of wine and to take order. Main course not served until 55 minutes after arrival. Had to request speed up because we were due at Royal Concert Hall by 7 and we had given ourselves plenty of time (2 hours) we thought! Slightly overcooked swordfish and almost raw broccoli - but the cod was delicious. A great meal in a great location. Couldnt find fault with anything. Some interesting new items on the menu since our last visit. We went with friends on this visit and one wasn't a big fish fan. I wouldn't say she was converted, but she did enjoy her food. "Best fish I've ever had" was her review! The mussels starter was delicious but the main courses were a little bland, I couldn't really taste the lobster in my crab and lobster burger. Good service. Interesting starters at Loch Fyne, the haggis & cheddar spring rolls and haddock scotch egg were delicious. Good quality fish mains. Would be nice to have more crab and scallop dishes on the menu but only as they are my personal preference over lobster and oysters. Very busy but good waiter - consequently slow service! Good pretheatre meal, served by attentive staff member even though they were really busy. Will come again, mussels to die for! Excellent meal at Loch Fyne, loved it would go again! Food was excellent at Loch Fyne, though it would have been nice for them to tell us that some of the ingredients in the salad were being replaced - when there's only 5 components you notice if they change one or two! Service was a bit slow at times and I think it's a bit pricey considering the smallish portion sizes but the quality of the food made up for that. Very good service at Loch Fyne and a great Steak! Great fresh seafood as ever at Loch Fyne! We tried the mussels all you can eat Tuesday offer at Loch Fyne. Great choice of different recipes. The mussels were very good and well cooked. I would recommend this restaurant! We arrived half hour before our reservation and was seated right away. The service was amazing and our server was very nice. The food was delicious and hit and the drinks kept coming :) all in all we will be going back very soon! 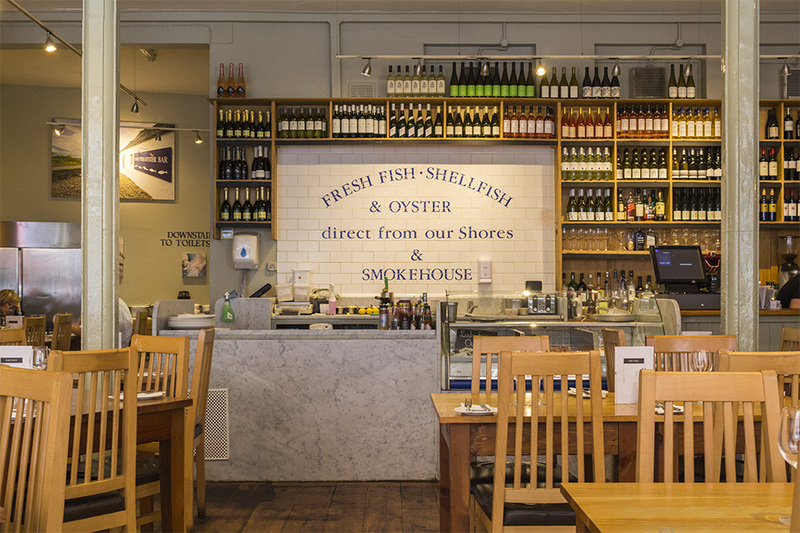 We have been to Loch Fyne many time and always had an excellent experience. We like the fact that the menu regularly changes, however the menu is currently quite bland and unexciting but the food quality was still very good. The service however was very very slow and we had to chase up appetizers and drinks. Hopefully this was a one off and the normal excellent standards will resume next time. Loch Fyne food is always good, although sometimes the presentation leaves a little to be desired. The oysters are the best I've eaten anywhere, even in France. There was insufficient staff available - our waiter was far too busy to give us full attention, but he was helpful when I realised that I had left my 'Friends of Loch Fyne' card at home. Overall, a good experience. Really great value for money, delicious food, fantastic and attentive service as well! Food is always good here. My Grandson realy enjoyed being shown how to prepare a lobster by the chef! However, computer systems here need looking into as second time bill has not worked out correctly, but when mentioned the supervisor has speedily stepped in to rectify this. Loch Fyne management need to address this urgently. Really really enjoyed the meal at Loch Fyne, the restaurant accommodated really well for my 18 month old too. I would definitely return for the lunch deal again. The King Prawn Spaghetti is one of the nicest pasta dishes I've ever eaten. Thank you. Fantastic food and the staff were lovely! A great selection of wines and the atmosphere was perfect. I'll definitely be returning to Loch Fyne. Excellent location for pre theatre dinner. Wasn't impressed at all had to ask for everything, service was poor and food was burnt. We eat out all the time and on first impressions we wouldn't go back. 3 of us ate, and really enjoyed our meals. I was particularly impressed with the smoked haddock with the genius touch crispy poached egg, on sublime mustard mash with creamed leeks. Yum. And the orange polenta cake was a thing of joy. Had a super meal Excellant food and value. A very enjoyable pre-theatre meal good food good service at Loch Fyne! Lots of food and great service, but not the best food I've had from Loch Fyne. Overall though still a great deal for £15! The food was excellent and tasted really fresh! However the service sometimes left a little to be desired even though they were not busy. The staff need to keep an eye on tables in case they need service. However, we would definitely go back to Loch Fyne! Another wonderful meal at Loch Fyne! Delicious starters - Madeiran herring and Duck Pate. Marvelous main courses - Mussels and Prawn Spaghetti, and wonderful wine. Sadly, no time to linger for the longed-for desserts! Oh well, we'll just have to go back another day for those! The meal was great however it was a shame that when we arrived we were told the £13.95 set menu with a glass of wine was no longer available. Served by Katie this evening - again a very attentive and pleasant server. The food was particulary good and tips on how to eat the lobster was asked and given without patronising. 5* all round, good food, good service and overall an excellent experience. We had a lovely meal at this restaurant, great service and atmosphere and fantastic value as a pre theatre treat. Thank you! Went for the pre-theatre menu and not only was it absolutely delicious but amazing value! Our waitress (Pearl) was so helpful and friendly, it really added to our evening. Will definitely be going back. Nice early evening meal at Loch Fyne! Booked for 7pm - tables not ready on arrival as still dealing with pre theatre crowd. But apologies given and table sorted quickly. Waitress was very friendly and knew her stuff. The food was great! Easy to recommend any of the fish dishes - all wonderful - and the marmalade pudding was a bonus! We will definitely return. A great dining experience. Our server, Jess was warm & welcoming. We will definitely be returning. Very noisy and tables really close to each other. Food as always excellent. Originally did not want to accept the offer booked but we were at least 5 minutes before the curfew of 6 p.m. They were unsure whether it would go through. If it had not been accepted we would not have stayed at the restaurant. All as expected as regular dinners. Friday fish offer superb! This was my first time at Loch Fyne and it was perfect. The service food and attention to detail were spot on! Lovely food but they had overbooked making it a bit hetic. Most enjoyable meal fish cooked to perfection perfect start to our evening at the theatre. Will be returning again shortly. Again a very good experience. Brilliant service from our waitress Josie. Great value for money. Will definitely be going again! Good friendly service, excellent food, good value for money, a little noisy when the restaurant was full. Good food and good value at Loch Fyne. With the 40% off main courses, excellent value too! Good food at Loch Fyne and good service. Enough said. It was the second time that we have had our experience with Loch Fyne and it was impeccable! Delicious meals, perfect service and a very nice menu of 2 courses with a glass of wine for only £13. I will definitely come here again. The only imperfection of this place is the toilets. It looks like the place inherited them from an old venue. It will be nice to see them refreshed and redesigned. Loch Fyne in Nottingham is a great place to eat and offer very good value for money. Food and wine choice was excellent. Service was a little slow but they were very busy and apologetic, so no problems there. Place noisy, too much wood. Having said that it was enjoyable and would definitely return. Had a lovely birthday meal with my friend. Waitress was lovely and food was very tasty. The granary bread was delicious. Would definitely go again. Drinks were expensive, we had a bottle of wine and a couple of gin and tonics. Worked out more expensive than our meal but would still go back. Wonderful food and lovely place. Would go again. Only slight problem was the service was slow, but Waiter and Manager apologised and we were given free bread! Spoke to two ladies at the next table who said they come regularly and the service was a 'one off'. Service was good and prompt. Scallop and Haggis starter was a bit lacking on scallops (One sliced) expected more for £6.95. Mussels were lovely served with plenty of bread and fries. Resaturant was a bit warm and bright. Fab pre-theatre meal and venue. Highly recommended! Great food with first class service. This was my first time dining at Loch Fyne. I was a disappointed when ordering to be told shortly afterwards that they had ran out of the Fish Pie (It was only 8pm) and then when I made a second choice of the Seafood Tagliatelle I was told that that they had no Tagliatelle and would spaghetti be OK instead. I appreciate that the dishes are cooked from fresh but I was still disappointed nonetheless. Superbly cooked fish and good wine, what's not to like? We were going to the theatre and by producing our tickets benefited from a 20% reduction on the a la carte menu - even better! Good service even though the restaurant was busy. This was a return visit and we chose our 3-course meal from the early evening set menu. The food was delicious and the service was excellent. I'll definitely go again and I recommend this restaurant. As you would expect from a fish restaurant, the fish is good. I had haggis and scallops and then fish pie and was perfectly satisfied. The service is friendly and efficient. Will go again soon. Two mild problems. First, the door from the street opens directly into the dining area so on a cold windy evening this is not a warm place to eat. And the decor is clean and plain but nothing there to soak up the sound so it is quite noisy. Another excellent visit to Loch Fyne! Food was outstanding again. Really enjoyed the experience again, a perfect way to spend Boxing Day!! My wife and I dined here yesterday lunchtime and it was very busy which meant there was a good atmosphere. We both had half a dozen oysters (natural) which were superb. Then I had kippers and they were done to perfection and quite delicious. My wife ordered the mussels as a main course and they were plump and also very good. The whole meal was excellent as was the service and the ambience and we can't wait to go to Loch Fyne in Nottingham again. Fantastic! This was our first visit to Loch Fyne and we'll definitely be back! Very good and friendly service at Loch Fyne, coupled with excellent food! A very good meal. Five of us had a Sunday lunch meal just before theatre. A varied selection, well prepared and presented food and nicely relaxed ambiance... Always friendly service. Highly recommended. Wonderful meal, fantastic atmosphere and extremely friendly staff at Loch Fyne in Nottingham. Would happily dine there again! We come every year for our Christmas get together and are always 100% happy with the wonderful food, excellent service and relaxed atmosphere. I would always recommend this restaurant - it's ace! A very busy pre-theatre time but a very efficient service ensured that we enjoyed a relaxed, high quality meal. We have dined many times at Loch Fyne and have always had a very good meal. Staff are very friendly and keen to please. We will continue to enjoy our visits in the future. The food was excellent at Loch Fyne! The ambiance not so. I had booked a table but was told to choose any table for two. I had a choice of one right by the door and next to the main thorough-way or one that wasn't ready; that had discarded napkins on and hadn't been cleaned. We chose the one that hadn't been cleaned. Our booking was for 5.45 - our show began at 7.30. The waitress was very pleasant, affable and competent, but the service was so slow. We had to abandon our half eaten puddings as it was 7.22 when they arrived and then we were delayed waiting to pay. So food excellent, but not enough staff to make it an efficient service. I would go again, but would book earlier to get to the Theatre for 7.30. I visit this restaurant fairly regularly and always enjoy it. Excellent service. Food very good. My sister had steak which was cooked how she wanted it. I chose the fish curry which I enjoyed. It was a good size for me but perhaps small for someone with a bigger appetite. Ambiance good. Can be cold if you have a table near the door. I will definitely go again. Good quality food at Loch Fyne, only spoiled by overcrowding and people waiting for tables. Felt like I was in goldfish bowl and people were waiting to pounce on me the minute I had finished to pinch my seat. Very nice place; great service and excellent food at Loch Fyne. As always food was superb at Loch Fyne! The service was excellent too! The food was excellent at Loch Fyne! The flavours just melted and mingled. Quick, efficient service, polite and courteous, but you did not feel rushed. We booked early @ 5PM and good job we did! The amount of people who were turned away was phenomenal. Always book in advance! It's just a fantastic place, great atmosphere and great food! And also excellent service! Loch Fyne is a great place, food was nice, service is excellent, really great friendly staff. Only issue is value, I realise there aren't many places to eat fish in Nottingham, but the portions are relatively small and the prices quite steep overall. However, still a special and occasional night out! Very busy and perhaps too many tables. However, staff very friendly and helpful and the meal was excellent. We had the mussels for starters and the fish and chips for main, both excellent. We had a lovely window table reserved for us and our waitress was very helpful. The lunch and wine deal was good value too. The food was great but we were a little disappointed that there were no substitutes for food no longer available. Lovely meal at Loch Fyne. Good service! Had a really lovely meal. Pre theatre with wine. Beautiful mussels and a excellent cream brûlée. I treated my mum and she loved it too. Will definitely come back. Loch Fyne is one of my favourite restaurants, where the service is always excellent and the food well prepared and presented. 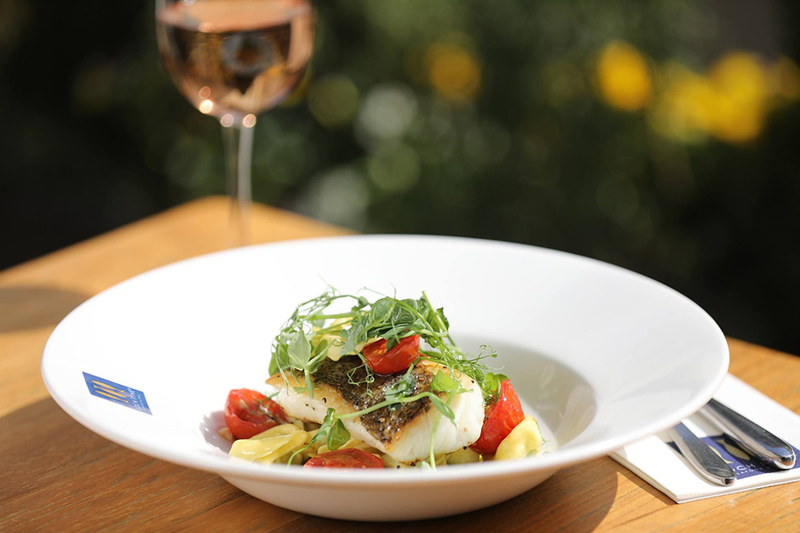 A special 2 course lunch and glass of Italian white wine for under £13 is a great offer. And these days you can catch the Tram into town and get off a short walk from the door. 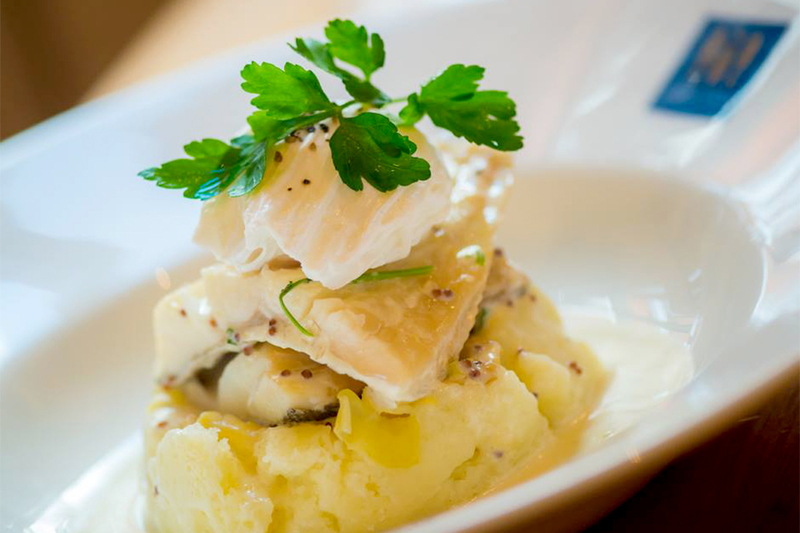 Tasty and fresh fish like always at Loch Fyne in Notts. Very busy, but waitresses did compensate for this. Another excellent meal with very friendly helpful staff. The only downside is it can be very noisy making it hard to hold a conversation at times. Will certainly come again! Lovely evening at Loch Fyne. Will make sure that I go back at some point. Was packed full on a Saturday night. Saw them sending a lot of people away. Must make a reservation for sure! An amazing experience with Loch Fyne in Nottingham. We went there for my husband's birthday and were absolutely delighted by the quality of food (my husband is French and he was impressed by the cuisine, as it turned out later, the chef is half French! ), by the service (served fast, a lot of attention during the evening, little candle for the desert, all very gentle and with a lot of care). We will definitely come back again. Well done guys! We hadn't eaten here for a while but were tempted back by a special lunch deal. The restaurant was very busy (it was Saturday lunchtime) but the service was good and there was a nice atmosphere. The food was very tasty although the portions seemed quite small - maybe because of the special deal. Overall a very positive experience! The food was very good at Loch Fyne. However, the drink service a little slow, lights too bright, music too quiet and the vents above the wine need a clean. Excellent lunch menu at Loch Fyne - 2 courses plus a glass of wine. Service was quick and waitress helpful. Always enjoy eating at Loch Fyne, this time though not 100%, the new potatoes a little underdone. Everything else fine. Well looked after at Loch Fyne. Superb service. Loch Fyne is a stylish restaurant with impeccable service. We would have been in trouble without booking in advance, as the restaurant became full quickly. The food is made from excellent ingredients, but the chef is cautious on the seasoning. Loch Fyne in Nottingham serves good food in an excellent venue! Felt the Bream portion sizes were much smaller than last time I visited Loch Fyne, Nottingham. Also had side of Samphire and it was quite brittle, felt like fishbones! But they offered us free coffees! Really pleased with everything at this Loch Fyne in Nottingham. Food was delicious, we had the early bird offer and there was no cheapness about what we had. The crab cakes, well I could have eaten these over and over. Will go back tomorrow. Apart from a problem with the booking itself, which was quickly solved by very friendly staff, there was absolutely nothing to fault with the restaurant. Attentive, but not intrusive staff. Loch Fyne in Nottingham has good food with very sizable portions! Faultless! Thoroughly enjoyed our meal at Loch Fyne in Nottingham! Loch Fyne Nottingham was absolutely fabulous in every way! Can't fault anything. Will definitely be going back! Lots of menu choice, excellent service from staff. Went for set menu, was great value for the price. We enjoy dining at Loch Fyne restaurant. The fish selection is always fresh and delicious and nothing is too much trouble for the staff so the whole experience is very enjoyable. Very good food. Delicious seafood. We have tried Valentine's Day menu and all three courses vere superb. Definitely would recommend to anyone and we will return some time to try out main menu. Very friendly and fast service, good vibrant atmosphere and good value for money. Really tasty food that I would recommend to anyone. Busy but expecting us. Good food, service, ambiance and value (had the set meal option x2). I love this restaurant, it never fails to deliver! The oysters are amazing and the early evening menu is such good value. The staff all also. Very attentive even though it was really busy! Gorgeous friendly atmosphere in a full restaurant, excellent waitress service, fabulous oysters & fabulous food. The tiny amount of Prosecco at £4.95 per glass could have been more generous but apart from that, excellent value for money all round. I booked a table for 2 at 545pm on Saturday evening. The restaurant was very full already when we arrived. The tables are a little too close together and the seating arrangements were quite squeezed. Apart from that, it was a wonderful dinner. We had 3 course for £12.45. The clam linguine main I had was excellent and the service was also excellent despite the restaurant being so busy. Our waiter Mitch made sure that we got dessert in time to get to the theatre before 730pm. Highly recommended if you don't mind the squeeze. Always good food and service. One moan though if you sit near the waiter station you are constantly hassled if you require more drinks by every waiter not just your own. That does get to be rather tedious though especially when the wine bottle is 3/4 full. Freshness of oysters was stunning, pleasing ambiance, great value and attentive service. Despite rennovation work next door (it sounded more like a rave!) the Manager and his staff were very attentive towards us and compensating us for the noise. Food was good and service was excellent. I would recommend it but only once next door has finished internal ovehaul. Excellent evening. Our first time at Loch Fyne and we were not disappointed. We had a lovely round table by the window. Service was attentive and the food was excellent, plenty of choice for everyone. We will certainly revisit this restaurant. I made a last minute reservation and everything worked out perfectly. The food was delicious, being extremely well cooked, and together with the prompt service and ambience of the restaurant made it a good experience. I will certainly return. Brilliant choice of food, well cooked & presented; service was excellent. We've already booked to go again! Nice food and solid service. The highlight was the half dozen oysters we ordered for a starter. These were some of the best we have had for quite a while. I ordered the 3 courses deal and my friend had 2 courses (both very good value!). We both had the homemade fishcakes with sweet chilli dressing and we both agree that they were very tasty and just the correct amount of dressing to compliment the flavour. For my main course I had the mussels of which there were plenty and again - very tasty - the white wine sauce that they came in was delicious! I had the passion fruit cheesecake for dessert (I've had this before so knew how very very nice it is - I remembered even though it was about 6 years ago!!) again - a lovely way to finish off. I found the staff very attentive throughout and the food came very quickly after ordering (within 5 minutes I'd say!). This was a very enjoyable evening meal and I will definitely be going again and taking advantage of this great value offer. Perfection as always. Ive been to this resturant many times and there is always excellent service and a really high standard of food. I have eaten at Loch Fyne on many occasions, but sadly this time wasn't as good as usual. We opted for the pre-theatre menu which we have had on many occasions but they have changed the contents. The Thai fish cakes are no longer authentic squeaky in your mouth ones. More normal fish cakes (balls) and the fish finger sandwich was on the small side as opposed to larger on previous occasions. The burger used to be able to be cooked rare - but the kitchen insisted on it being medium to well done - maybe they are using frozen products?? But the burger used to be my partners favourite and now its mediocre. Perhaps they have a new chef? A little disappointed. Good meal - consistently good food whenever I've visited. staff really helpful and friendly. Great food, great service, lovely atmosphere and good value for money. I love the food in this restaurant. Everything is fresh, well cooked and nicely presented. However the Nottingham restaurant doesn't have much space and so the atmosphere isn't the best. Service is good but again the cramped restaurant doesn't leave much space for the service staff to move about in. First visit to Loch Fyne Nottingham last night. The food was exceptional, the service was brilliant and we could not have had a better night. We will be returning again soon. Not as good as our normal visits. Very squashed up to the large party next to us. A little cold in the restaurant. 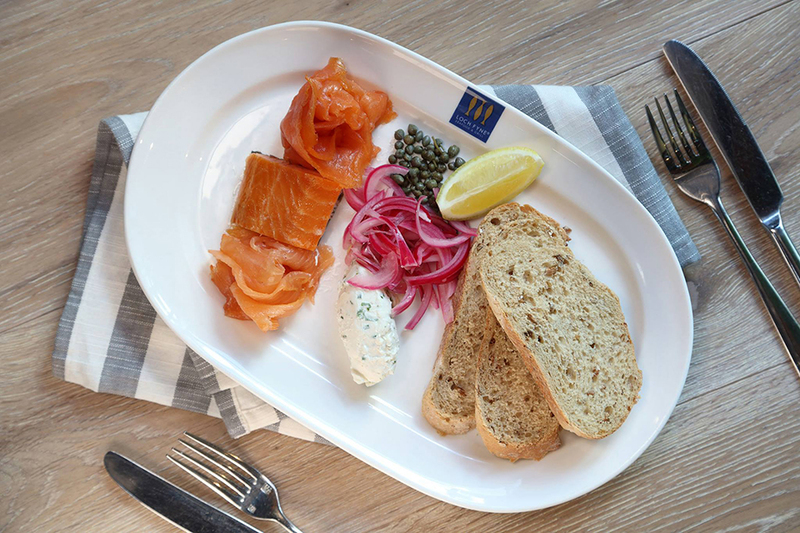 Fresh food at Loch Fyne - always worth a visit. Enjoyable meal with good service. Tables too close together though. Door opening directly onto street allows drafts and cold air to regularly cause temperature to drop. The food is very fresh and tasty at Loch Fyne. Even though very busy the service at Loch Fyne was good and the food was excellent. They run a good offer for early booking times. Went to Loch Fyne in Nottingham last night for pre theatre meal. Not been for several years. Food great, service brilliant and unobtrusive. Two courses and wine beautifully cooked and served for less than £30. In and out in less than an hour without feeling rushed. Will now be our first choice city centre restaurant. Had the crab fish platter with added mussels and clams as a main between 2 of us. Very well presented and excellent seafood. Langoustine's though had been overcooked to mush. Place was heaving busy on a Saturday lunchtime and not enough staff on to cope. People were being left waiting a long time to even order drinks. Had to wait for my bill and eventually ask for it again when I had planned sweets and coffee. Just glad to get out in the end, which was a shame. Only complaint here is, we don't go back often enough! Always excellent at Loch Fyne in Nottingham! Never been? Book now!! My partner and I recently dined at Loch Fyne Nottingham and were very impressed with the friendly staff and their useful advice on the tasty dishes available. The food on a whole was excellent quality, superbly cooked and well priced. We will definitely be going there again soon. I have only been to Loch Fyne in Nottingham on one occasion, but I would certainly go back and would definitely recommend the restaurant. The food was excellent (and I'm a vegetarian, so obviously wasn't eating the speciality!). The service was good and pleasant, even though they had a very full house. Overall a very enjoyable evening, in a bustling, lively (but not too lively!) restaurant. A little disappointed there were no mussels, but understand due to very hot weather conditions, all mussels were lost! Lovely, friendly and helpful staff. Made our first and not last visit most enjoyable. Well done. Food good too. Great to see a place busy on a Monday evening. I love this restaurant - the food was excellent and fresh - try the grilled hake mmmmmmmmmmm! Always enjoy a meal here. The three course menu at £11.95 is a real bargain. Will come again. Great place and great food loved it. Will definitely go back again! Okay food, my starter appeared to lack mango of substance. Very noisy. Service okay but slow. Had a great meal and service was friendly and quick. We had a lovely evening, the food was good. The restaurant was OK for a fish eatery though i though my mains was dry. It was a bit noisy and too compact while eating. A good staple, although service was a bit rushed on this occasion, an extra staff member would have been kept busy. Even though not at all busy service was a little slow. Wonderful meal, excellent value. Even though very busy service excellent. So glad we booked a table. I love this time of year at Loch Fyne - the oysters are enormous and (to be honest) they're the reason I go there. We were a mixed age group of 5 and had a lovely dinner with just the right amount to eat, the service was absolutely top (we were even recognised by the waiter who served us last time) and it was a thoroughly pleasurable experience. Very good value two course meal. Excellent service. Glass of wine over priced for quality. Excellent food and well mannered staff who were only too happy to help. As my first experience of Loch Fyne I was very impressed! The food was fantastic and very affordable, with the service efficient and attentive. The atmosphere was warm and welcoming with laughter a constant sound in the restaurant. Food wise the generous portion of mussels meant I could “help” my partner with her main dish! I will easily go back to Loch Fyne for another taste! Great new lunch time menu. Great value for money. Food was nothing special and carelessly presented. Service was pleasant but stretched in terms of capacity. Not as good as the last time I ate there. The food was good but was spoilt by the long wait for the side orders to arrive at the table. We had difficulty hearing the waitress and to hold a conversation due to the volume of the music. The service was very slow given that there weren't many people dining. We were left for some time on our own waiting for our bill at the end of the evening. Great seafood, in nice surroundings. Love the ethics of the company, with a nice Scottish slant on the cuisine. Again - good food and good value. Service always friendly. Good food, always good value and friendly service. We had a lovely eating experience at a busy Saturday lunchtime. However, the service and the food were excellent. Thank you. We had a great time at Loch Fyne. The manager and waiters were very nice and helpful. We enjoyed a starter and main, which were both very good and had a German Riesling to accompany the food. The size of the Seafood Selection was a bit small but delicious. My company had a whole Sea Bass which was very delicious. Overall a great place to go. Looking forward to visiting Loch Fyne again. We had a great night out at Loch Fyne. Was celebrating a special occasion with my wife and really enjoyed every aspect of our meal. We both love seafood so love the fresh counter at the front and really enjoyed both of our main courses. Probably going back again in the new year. wonderful food, service. wonderful time again. love this place. Tried a couple of the dishes on the menu with my boyfriend and we thought they were both very good. Will be back in the near future! Had a superb early evening meal - exceptional value and nice selection of dishes to chose from. I tried a new dish last night. The flavours were good but the squid was very chewy! Service was good. On the whole I enjoyed the meal. The food was good. The service was very slow, to say it wasn't busy. Our drinks that we ordered on arrival were left at the bar for quite some time. Very nice meal, really well cooked. Service was very good. Really enjoyed it. We are regular customers at Loch Fyne and will continue to visit. excellent food as usual with a good set of choices for the early evening deal. Service a bit distracted but friendly. As ever this restaurant is one of the best in Nottingham. Good value on the fixed meal. Service a tad slow, and its never going to be a great ambience given its location, but superb food for the money. Actually we didn't use the toilets so can't comment! The meal and service was great. They pack a lot of people in so the ambiance is not great, but the meal and service were superb. We will definitely go there again. Amazing food, really nice variety of things on the menu, friendly and helpful staff - would definately recommend! We had the £11.50 special offer, really good value, service was very good, tables too close together, but appreciate only small restaurant. Toilets down stairs, could be cleaner as could the corridor leading to them. Fantastic food, great restaurant but a little bit pricey! Food was ok fish in batter a little overcooked the portions have got smaller. I am a regular visitor at Loch Fyne and usually enjoy the food very much. I was disappointed last night, the fish was very dry and overcooked. My friend who ordered mussells said his weren't good either. He tried to speak to the waitress but she walked off trying to make out she hadn't heard. We dined there last week and that meal was not too good either. It's a great pity because I only eat fish and have always been a great fan. It's too expensive not to be able to eat the food. Very disappointing! Staff attentive knowledgable about the food & wine. Food very good. Lemon panacotta lovely but I would have liked it to be a little sharper. My partner would have liked to see more fish choices. Toilets ok but what a climb! Not good for someone with mobility problems. Will visit Loch Fyne again though. Our meal was as usual excellent, the only downside being I was given the wrong main course. I did not realise until I started eating it that what looked like a pile of rice under my fish was mash, but it was still smoked haddock and it tasted fine. I did point it out to the waitress and received a free choc cheesecake and coffee as an apology which I thought more than fair! The service was good despite the place being full to capacity and we are already looking forward to another visit in the not too distant future. Me and my girlfriend love seafood so we decided to go to Loch Fyne and i must say it was really really good food, the atmosphere was really nice and it wasn't too expensive. I can't wait to go back and would recommend it to anyone! The smoked Mackeral was amazing !!! As always at Loch Fyne it was a really enjoyable meal. Good atmosphere and the pre theatre menu is very good value. Toilets were a bit smelly and not really very nice. Staff attentive and gave good service. The Scottish whiting was delicious. Too many tables in too small a space. Difficult to attract staff; left sitting waiting for a long time. Bread was extra! The set menu is very reasonably priced for the two courses that you get. If you go before 7 then service seems to be extremely quick. If you are looking for a classy meal in the city centre then this place fits the bill exactly. You do not have to like fish to go (they do other meaty dishes) that obviously is their specialty and if you love fish then a visit is highly recommended. Early diner menu excellent value, food, service, all good had a really nice evening. Great food but portions a bit small. Would return. Food was superb as always, friendly service and accomodating to changes on the menu. My only negative was the rather large christmas party group that was in as with a small restaurant like this it overpowered the smaller intimate tables. Amazing service, greeted instantly on arrival by waitress who was very attentive throughout. Food was delicious and great portions! Brilliant, thinking of going again sometime. I was spoilt for choice. nice well cooked food although bread was a little dry and mussels under seasoned. Friendly helpful staff. pleasant restaurant, lovely food and good attentive service. Loch fyne is an excellent venue providing a good choice of food, all well prepared and presented, would book again. The service provided by Go Dine is also excellent. From arrival to leaving were totally spot on. Knew who we were and our seating request on entering. Had a choice of seating. were informative yet not overbearing. The food was beautiful in terms of presentation and taste. Have already recommended to friends and work colleagues and would have no qualms at either visiting again or recommending to others. Great food as usual. Pre theatre offer meant also very good value. a good choice for a pre-theatre meal. I love this Restaurant - we opted for the Crab plater, and had the sashimi with wasabi and the whitebait to start - all fabulous. Our waiter was fantastic - we sampled several wines before choosing the one we liked the best and the sticky toffee pudding was devine. Very nice food and a rare opportunity to enjoy some good fish dishes! I really enjoyed the Brada Rost (kiln roasted salmon) and my creme brulee dessert was excellent too! Excellent resturant, food is always brilliant, the waiters are attentive, know the food exactly and are extremely helpful. Can't fault it on any level. Food was a bit disappointing but would go again to try something that might be less bland! 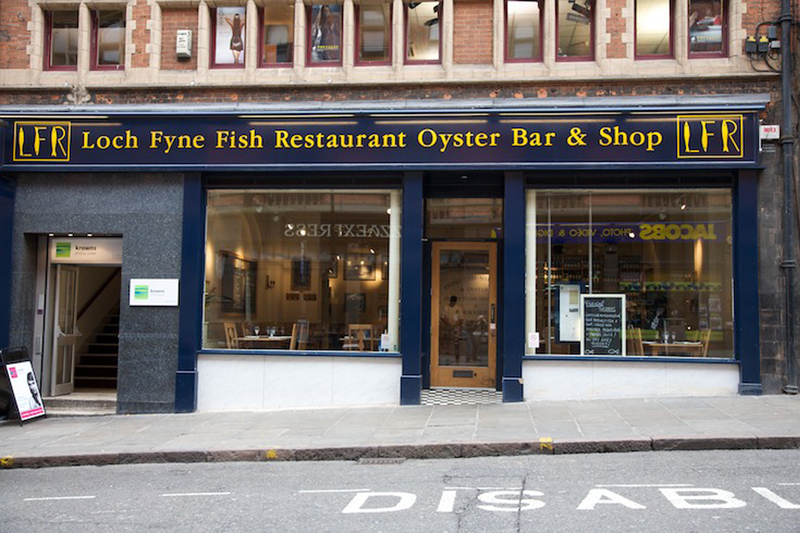 Right in the heart of the city centre is Loch Fyne, Nottingham’s premier fish and seafood restaurant. Located on King Street, just off Upper Parliament Street, it's a short walk up from Old Market Square. Its close proximity to the Royal Centre makes it the perfect place to enjoy a pre or post-theatre meal. 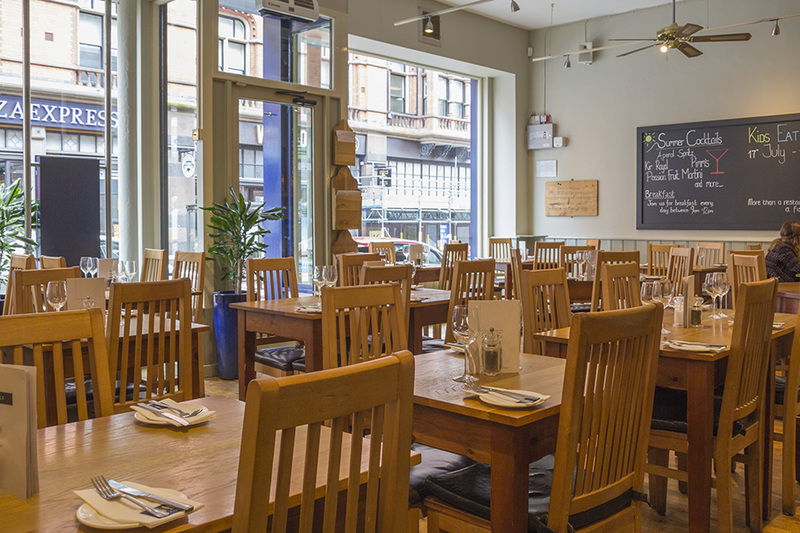 Loch Fyne offers guests a chance to escape the hustle and bustle of the busy city centre and enjoy fresh, exquisitely cooked food. 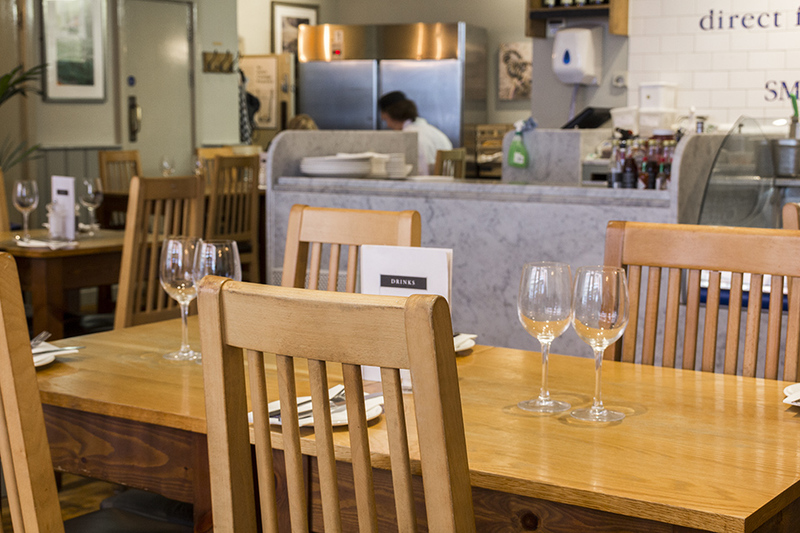 The restaurant is light and airy during the day, inviting and cosy in the evenings. The décor is kept simple and neutral, with matching wooden furniture interspersed with a granite bar, whitewashed walls and sophisticated art work. The dining room is large enough to comfortably host a party, yet small enough to feel intimate. The restaurant also features its own fish counter, tempting diners to pick up their own produce in order to create culinary masterpieces at home. As you can expect from a seafood restaurant, the menu is densely packed with the freshest flavours of the surf. It offers everything a seafood-lover could wish for, from sophisticated starters and hearty mains to indulgent desserts. When available, you can expect to see Loch Fyne's oysters on ice, sea bass and scallop ceviche plus pan-fried chilli and garlic king prawns for starters. The mains are sure to impress, with baked lobster, the Loch Fyne tuna steak melt and the impressive shellfish platter stealing the show. Add to this the classic fish and chips - served with mushy peas and tartare sauce - and you're spoiled for choice on the seafood front. Those who prefer turf do have a few options to choose from, including confit duck leg with kimchi cabbage as well as the delicious 28-day aged rib-eye steak served with Café de Paris butter, field mushroom, pickled onion rings and twice-cooked chips. 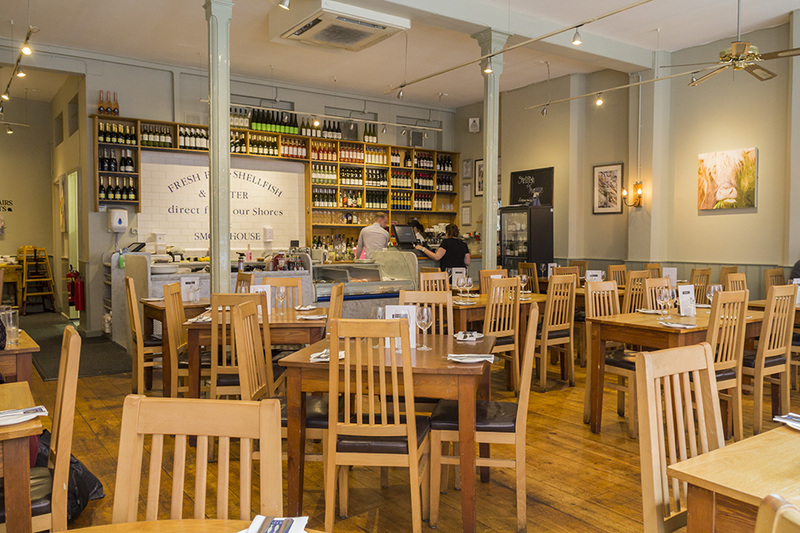 Loch Fyne restaurant in Nottingham is a mecca for fish-lovers across the region, and well worth the visit if you're a connoisseur or someone wanting to try out the cuisine of the sea. The set meals and lunchtime offers are incredibly well priced; the restaurant looks set to be a favourite for many years to come. All of our beef is hand cut by the Royal Warrant holding Scottish butchers, Donald Russell. All fish from the Fish Market are served pan-fried, grilled or steamed, with a sauce and two sides of your choice. Unlimited Loch Fyne mussels and a drink for £15 per person - the first mussel dish is served with French fries and crusty white bread. Available Monday-Saturday. Includes a glass of wine! PLEASE NOTE: This offer is not available in December. Our children's menu is full of favourite dishes – including seafood, meat dishes, and vegetarian options. Plus, every meal also includes a free colouring kit and balloon to take home. 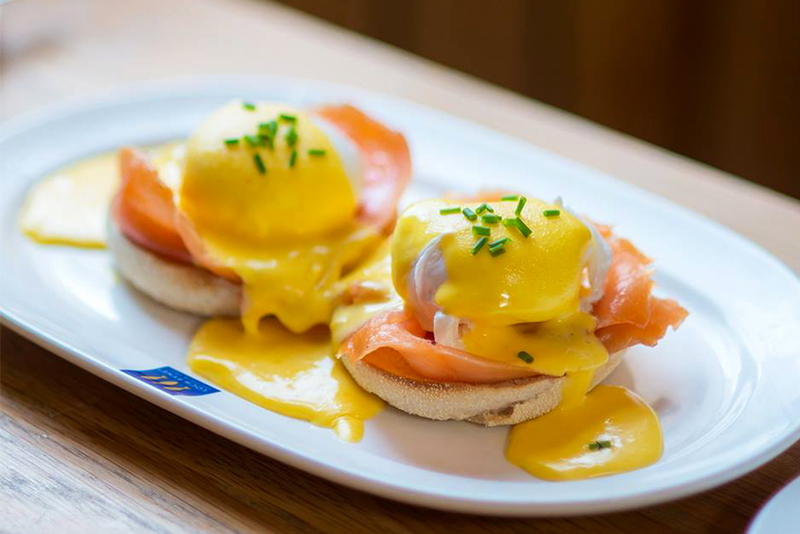 Start your week off with a Loch Fyne Breakfast, every day between 9am and 1pm! Fancy Eggs Benedict or a Full English, you can even personalise your own breakfast. Prices vary depending on what you choose but are very reasonable, take a look at the menu and book! Bring the little ones, 2 courses for just £7 or 3 courses for only £9!